There are farms that tie their name to the history of a specific area, thanks to their dedication to the land and their passion for tradition. The Ronzano family is this: genuine, professional, cohesive, and protagonist of those hills that characterize the area of Costigliole d'Asti. The pages of the history of the farm are written under the Bricco Lu, in Val Cioccaro, a land in which the founder Renato Ronzano, since the '40s, has cultivated and respected, getting, over the years, quality wines which are the result of a large attention to the various work in the vineyard and in the cellar. Thanks to the help of his son Giovanni the bulk wine and the bottles tell their customers the world of the Langa of Asti. A world that Marco (enotechnician), Paola and Chiara, children of Giovanni, renew: the respect for the grapes as the fruit of the land, the link with the tradition and the pursuit of sound quality are very clear in their work. The Ronzano farm keep working in the sign of that family union that has always characterized this reality. THE VINEYARDS: RESPECT. "Respect", a word that the Ronzano farm knows well. Witness the fact that, as always, the vineyards are owned by them, and develop on the hill next to the winery in Costigliole d'Asti and are cultivated mostly Barbera grape, symbol of the area of Asti. 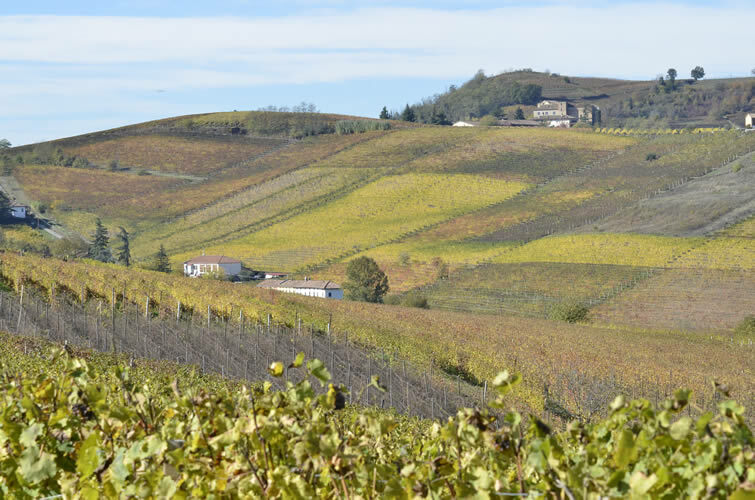 There are also hectares in Neive which are cultivated Moscato and Nebbiolo. Complete the production Dolcetto, Bonarda, Grignolino and Cortese. THE PIEDMONTESE CATTLE: THE QUALITY MEAT. The passion of Giovanni Ronzano for breeding over the years has led the Ronzano farm to propose the Piedmontese cattle certified Coalvi. A quality meat obtained from cattle that grows in the area, aimed at those who want to consume healthy and nutritious food. Three hundred head, a butcher open to the public and sacrifice. This also means being cohesive to the land of Asti. THE TRUFFLE: A PRECIOUS FRUIT. Ronzano, a historical name of the fascinating world of truffles that can be defined as the precious fruit of the land. The white truffle of Alba has always been present in the family that has been able to enhance it as the protagonist of the area and as a witness of the tradition of Langa. The truffle closes the circle of life of Ronzano family which, including wine, breeding and Magnatum Pico has always respected the land and its traditions.